One of the icons of the city of Yogyakarta is a student, but who would have thought Jogja is also famous for its culinary food or tablets as well. Lots of tourists and even foreign countries of foreign tourists who come to it apart from the tourist attractions there are also those who deliberately make themselves might just look for souvenirs and snacks this jogja typical cuisine. For those of you who have never been to Jogja let for taking the time to get there, and you also need to even mandatory memcicipi bring some snacks and culinary specialties of Jogja. I felt interested in as an admin wants to write and review of some typical snacks Jogjakarta. Bakpia is one of the typical jogja cake, this cake is usually bought by tourists and frequent travelers and serve as a souvenir. Besides having a sweet and savory flavor bakpia is traditionally made with flour dough filled with green beans in it, but now you can find bakpia with vareasi and diverse flavors of like cheese, peanuts, chocolate. Where can I find this bakpia ? 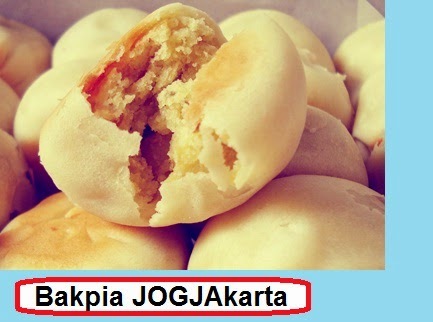 You can find bakpia in the area west of Malioboro, on the road or KS. Tubun. We recommend to buy bakpia pathok 75, or Bakpia Merlino known that feels most comfortable. Good luck hopefully. 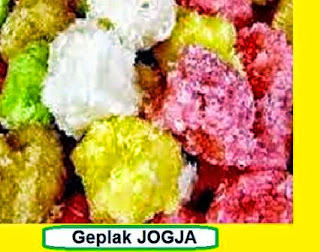 Geplak is one tasty snacks and play, for you lovers of candy or sweets mais-you can try this snack stau. For your and our advice and people with high blood sugar, possibly, you should avoid this one cake because it tastes sweet. Like most typical food of Yogyakarta. And for those of you who just want to buy as souvenirs you should buy this cake. 0 Response to "Typical snacks Jogjakarta"